Current Speaker of the Philippine House of Representative Pantaleón Álvarez recently came under fire after his extramarital affair was exposed. To be precise, he copped some flak from some sectors of society, but not all. Apparently, it was an “open-secret” in Congress that Alvarez has a girlfriend, but for some “reason”, presumably because he is a man, nobody made a big deal out of it. However, since the information has been made public, there is now outrage coming from his critics, members of the Integrated Bar of the Philippines, and women’s group Gabriela, among others who did not hold back in reminding him that as a lawyer, he is “held to the highest standards of morality, behaviour and professionalism” compared to the rest of us in society. Well, that’s too bad for Alvarez, I would say. The rest of us can get away with being naughty since we are not lawyers and are not held to the “highest standards of morality, behaviour and professionalism”, if my interpretation is correct. I think some of the people especially the ones in Alvarez’s circle who are criticising him simply feel obliged to make a “strong” statement against his affair for the sake of the public. I mean, why are they making a fuss about it only now? They should have done it as soon as they caught wind of his illicit girlfriend. I find it hard to believe that they didn’t know about his “dangerous liaison” considering Alvarez wasn’t hiding his girlfriend and was said to be “flaunting” her around town. 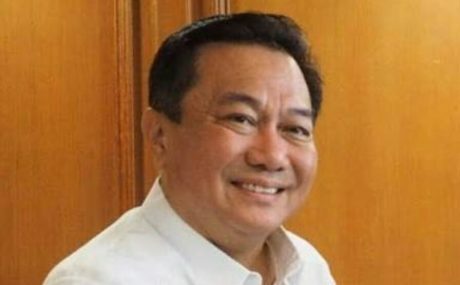 Some Congressmen like Harry Roque even defended him by saying that Alvarez never concealed his estrangement from his wife and his relationship with his girlfriend anyway. Goes to show that it is normal and acceptable for men in the Philippines to have a girlfriend or girlfriends. Senator Leila De Lima’s supporters are acting outraged and claiming “double standards” since members of Congress along with the general public made a big deal of De Lima’s own extramarital affair after it was exposed. They were asking how it is that people could be so forgiving of men who are having an affair but harshly judge women who are caught committing the same “offense”? They raised a good question, indeed. I think it is high time people accept that both men and women are capable of having extramarital affairs and should be treated the same way. “My God, who doesn’t have a girlfriend?” he said on Thursday. Alvarez has also admitted having children with different women. “So you won’t have difficulty finding out, I have eight children. I have two with my first wife, four with the second. And then, there were two more. But none with my present girlfriend,” he said. “I am just like you. I hope your wives are not listening,” he told his male radio interviewers. Ironically, some men commended Alvarez for his “honesty”. They probably look up to him now as their “hero”. Alvarez’s admission was quite a contrast to how De Lima kept being coy about her own affair even though it was also an “open secret” for years that she was in a relationship with her then driver/bodyguard Ronnie Dayan while she was the head of the Department of Interior and Local Government. Even those who didn’t want to know knew about De Lima’s extra-curricular activities due to the various memes depicting how close she was to Dayan. Intimate photos and videos would constantly pop-up on social media sites for everyone, including the young and old. You can be forgiven for saying that De Lima was being a hypocrite in trying to dodge questions about it and not admitting to her “indiscretions” straight away. She was only lying to herself and believing in her own hogwash especially the part when she used “frailties of a woman” to excuse her behaviour. She could have simply said “I was stupid” and asked for forgiveness. Perhaps then, the public would have been more forgiving. Don’t get me wrong, I think Alvarez should resign out of delicadeza and so does De Lima. It’s one thing to continue in their posts pretending they are not doing anything wrong while things are still a “secret”, but it is another thing when the general public already knows that they are violating the rules. They were both married when they had gone into another relationship and as lawyers, they knew it was against the law. It’s further proof that our own lawmakers cannot follow the law. No wonder the country is still considered a basket case. President Rodrigo Duterte also defended Alvarez and said his affair is a “non-issue” since Alvarez is not a Catholic, but a Muslim. His religion notwithstanding, we have to disagree with the President and remind him that lawyers are “held to the highest standards of morality, behaviour and professionalism”. In the past, the Supreme Court already disbarred two lawyers for having extramarital affairs due to “gross immorality and violation of the lawyer’s oath and the Code of Professional Responsibility”. The only solution to this perennial dilemma in Philippine society is so obvious, it is staring everyone in the face. In Filipino lingo “kung ahas yan, natuka ka na”. These so-called lawmakers who keep getting caught with their pants down should change the law. They are often coming up with self-serving laws anyway, so why not come up with the law that would “revolutionise” the way Filipinos think? They should finally come up with a divorce law instead of going around things the hard way by using “annulment of marriage” and suffering the inconvenience of sneaking around. After all, most of the things that are causing distress in society is man-made. Marriage is a human construct. Who and why did “they” think we should belong to just one person anyway? Marriage is actually not a natural state. Coupling, if you observe nature, is mostly for the sake of mating. Only a few members of the animal kingdom stay together as couples after mating. According to historical records, the custom of marriage was created “to protect the property rights of clan patriarchs to holdings of land and cattle”. In other words, marriage is mostly for convenience. It reduces the drama of having to choose who should get the inheritance after the death of the “bread winner”. But nowadays, both men and women can be breadwinners. In De Lima’s case, we know who was bringing home the bacon. To be sure, women joining the workforce has changed the landscape in the household. It proved that women too are capable of doing what men can do like buying land and cattle for the brood. The point is, traditional roles have shifted and because of this, customs and traditions must be reviewed by our lawmakers to see if it is still in line with today’s social realities. Having said all that, there is a scientific reason why most people in most societies frown on women having affairs while men get away with it unscathed. Since traditionally, men were expected to “provide” for the needs of his children, a man would instinctively want to know if the child his wife is carrying is his own. The rest of his clan would expect the same “fidelity” from the wife since they too are expected to care for the child. Unfortunately, it will take some time before people’s mindsets adjust to the idea that nothing lasts “forever”. Like fashion, people’s needs change. People will not always get what they need – security, romantic love and desire – in one person. Only a few people are or will be lucky enough to find all of that in just one partner. In some situations, people find “happiness” because they didn’t have a lot of choices. Yes, sometimes having too many options can lead to one’s unhappiness. Which then begs the question, will having a divorce law make people happy? People will know the answer to that while they are crossing that bridge. Until then, we all have to act like we are outraged the minute we find out someone has “violated the rules”. The great American jurist once said that the law is all about experience. Any law that does not reflect man’s general experience will often than not be broken for always. The tremendous influence of the Roman Catholic Church on the Filipino People as an result of the bloodless transition of power from Marcos in February 1986 is now shattered in just a generation of hypocrisy of the RCC heirarchy and psychopant politicians around them. It is now time for legislators to craft laws that reflect a secular State than cater to the religious beliefs of than more than 80% Christians of these country. Otherwise, a male dominated legislature may end up crafting laws favoring the Islam Faith that may usher in a dangerous religious divide. Selfishness is not living as one wishes to live, it is asking others to live as one wishes to live. And unselfishness is letting other people’s lives alone, not interfering with them. Selfishness always aims at creating around it an absolute uniformity of type. Unselfishness recognizes infinite variety of type as a delightful thing, accepts it, acquiesces in it, enjoys it. It is not selfish to think for oneself. A man who does not think for himself does not think at all. It is grossly selfish to require of one’s neighbor that he should think in the same way, and hold the same opinions. Why should he? If he can think, he will probably think differently. If he cannot think, it is monstrous to require thought of any kind from him. A red rose is not selfish because it wants to be a red rose. It would be horribly selfish if it wanted all the other flowers in the garden to be both red and roses. To tell you the truth, I have only one wife, and I don’t play the sexual adventure games, anymore…, because , I am married to a nice girl and have more important things to do. Besides, I am afraid of: HIV, “tulo”, “kuto”, vaginal warts, syphilis, etc..
We should pass the Divorce Law. If the marriage no longer work, for both husband and wife. Why keep it ? This “Alvarez issue” issue is again a debatable issue ! yes it’s normal now and it’s personal. not like to be a druglords/pushers’ coddler and protector, that’s different. crimes committed to the people is very different from personal life. whatever say, the yellows, against duterte, the people will still be behind president duterte. they just hate the yellows so much evidence will tell. @Rosebud What about those cheating husbands and wives who are diehard pro Pnoy?